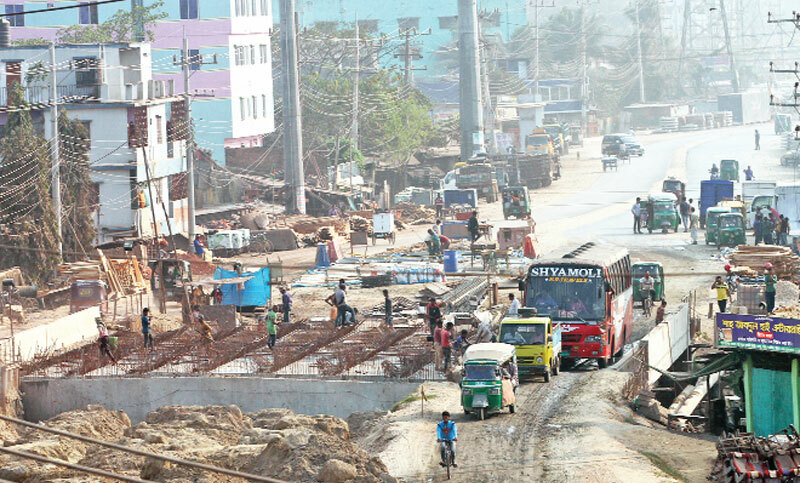 The development works of the ‘Approach Road’, one of the main roads for reaching the city from the South Chattogram upazilas and Cox’s Bazar district, are going on in full swing to address sufferings of the commuters. Concerned officials informed that the entire works of the road will be completed by June this year as around 80 per cent works have already been completed. Sources said Roads and Highways Department (RHD), Chattogram Circle started the development works of the road under a project titled ‘Third Karnaphuli Bridge Approach Road Project, Chattogram’ around one and a-half years back. Different works including upgrading the road to six-lane, construction of four bridges, eight culverts and two underpasses are being carried out under the project, they said. Besides, upgradation works of four-lane of three-kilometre road from the South end of the bridge to Trimohoni (Anwara Crossing) are also going on under the same project involving Tk 270 crore. But, sufferings of the road users including transport workers, pedestrians and passengers know no bound due to its dilapidated condition. Visiting the busy road on Sunday afternoon, it was found that the development works of underpass and culvert along with the road were going on in Rahattarpole, Kalamian Bazar and Rajakhali Khal areas. Vehicles were seen plying through two narrow lanes of the road causing immense traffic congestion. The project’s construction materials kept on the both sides of the road were also contributing to the traffic gridlock. Locals and transport workers expressed their resentment over the slow pace of the development works. They alleged that air pollution due to the flying dust being produced from the digging works reached to an intolerable level in the area. Though the authority concerned claimed that they spray water in every two hours to keep the dust under control, the locals termed the efforts as insufficient. Bachhu Mian, who runs a tea-stall beside the road in the Kalamian Bazar, said number of customers reduced to around half due to dilapidated condition of the road. “I have to clean the items of the shop frequently due to the dust,” he said adding that none dares to come at the road without wearing mask. Shah Alam, an inter-district bus driver, told the daily sun that it has become so tough for them to drive vehicle due to the bad condition of the road. Expressing his resentment over the slow pace of the works, he demanded faster implementation of the project. The driver claimed that earlier they could reach the bridge within 15 to 20 minutes from the Bahoddarhat area, but it now takes around an hour. Echoing the driver, many transport workers also came up with the same allegations. Contacted, Roads and Highways Department (Chattogram circle) Superintending Engineer and also the Project Directory (PD) Abu Hena Mohammed Tareq Iqbal told the daily sun that they will complete the development works by June this year. “Though there is a schedule to compete the works by November, we will complete it by the middle of the year considering suffering of the road users,” he said. The engineer observed that road communication between the city and South Chattogram upazilas and Cox’s Bazar will be easier after completion of the works. Local vehicles will ply through specified lanes of the road and take and drop passengers at the designated stoppages, said the engineer. On the other hand, the long-route vehicle will move through the rest four-lane and there will be have no stoppage from the Bahoddarhat to the North end of Shah Amanat Bridge for them, PD Iqbal said. He also informed that the ‘Approach Road’ will be the first-ever six-lane road in the port city.